A quartet of side-firing 10.5-inch x 9.5-inch ‘inertially balanced’ passive radiators that were derived from the design of the firm’s successful SuperSubX powered subwoofer. In a move many will think to be long overdue, Mark Levinson debuted its first-ever turntable and tonearm package, called the No. 515 and slated to sell for $10,000. The Levinson turntable/tonearm was developed in partnership with VPI Industries (makers of the critically-acclaimed Prime and Avenger turntables, to name just two of many), but the No. 515 offers a feature set somewhat different from VPI models that sell at comparable prices. To be candid, there was so much traffic and were so many concurrent conversations taking place in the Levinson room when I stopped by to visit that I was only able to see but not really audition the new Levinson vinyl spinner, but based on what I saw I’m eager to hear what this new analogue system can do. Many audiophiles hold the German firm MBL and its vaunted omnidirectional loudspeakers in very high regard, but a challenge for any would-be MBL speaker owner is the admittedly thorny issue of how best to drive those speakers. Stated simply, when it comes to amplification MBL’s speakers tend to be demanding with a capital “D”! Naturally, MBL’s flagship range of Reference-line electronics are up to the task, but frankly those models tend to be physically massive and to carry correspondingly wallet-crushing price tags, so that’s what’s desired is a range of electronics that can make the top-flight MBL speakers sign, yet that are at least somewhat more compact and that sell for merely expensive (as opposed to ohmigosh-über-expensive) prices. Enter MBL’s new Noble line electronics, comprising the N11 preamplifier ($14,600), N31 CD player/DAC ($15,400) and the N15 510-watt monoblock power amps ($17,800/ea.). Note that each MBL 101E MkII loudspeaker requires two N15s, so amplifier costs can add up quickly. Having heard MBL’s 101E MkIIs driven by the firm’s over-the-top Reference-line electronics many times, I can honestly say the new Noble-line electronics give up very little in the way of performance vis-à-vis their larger and far more costly siblings. And that, I think, is the point. As you can see from the accompanying photograph, the Noble-line electronics can fit neatly on a conventional hi-fi shelf and look good doing so, whereas the Reference equipment is so big that your listening room might well wind up looking like a high-end audio ‘shrine’ (complete with ‘altars’ to the massive Reference power amps) and not a practical living space at all. In simple terms, the Raidho D4.1 is a (slightly) scaled back adaptation of the design of the firm’s very large flagship D-5.1 floorstanding loudspeaker; the D-4.1 features four 115mm diamond-coated bass drivers, two 100mm diamond midrange drivers, and one sealed ribbon tweeter. My thought is that in most rooms and for most musical tastes, the D-4.1 would meet or exceed most listeners’ desires for an ultra-capable full-range loudspeaker. As you would expect of a top-class offering, the D-4.1 provides excellent extension at both high and low frequency extremes, killer dynamics, exceedingly good resolution of low level details, and an all-round quality of musical expressiveness that just won’t quit. But unlike so many top-class efforts, the D-4.1 doesn’t appear particularly finicky, nor does it have those faintly astringent, ‘medicinal’ qualities that afflict so many other top-end loudspeakers. On the contrary, the D-4.1 is endlessly beguiling and downright fun to listen to. Making the speakers’ potential come alive were Aavik’s first-ever preamp/DAC/phonostage (the C-300) and its companion power amplifier (the P-300), which is billed as having a “unique 150-watt efficient Class A” output section that—as is often true of well-done Class A—sounds more powerful in actual use than its published output specifications would lead you to expect. Finally, tying everything together were Ansuz cables and an Ansuz very low-noise power distribution system. I heard this system near the end of the show one day and I must say it stopped me in my tracks, made me forget all about trade show fatigue, and simply compelled me to be quiet and to savour the music. When the listening session drew to a close (gulp!) about an hour, I felt as if I could and would have kept right on listening had time permitted. In short, this system inspired what I can only call a serious case of audio lust. My only hope is that all of our readers will at some point get to enjoy music systems as satisfying and joyful as this one proved to be for me. Many of us are familiar with Revel’s very good Performa3-series loudspeakers, so that it can be easy at first glance to overlook the firm’s visually similar Performa3 Be-series models, which were shown as proof-of-concept offerings at CES 2017. The Performa3 Be models on display were F208BE floorstanders (projected to sell at or below $10,000/pair) and the M106BE standmount monitors (projected to sell at or below $5,000/pair). But here’s the thing: as you look and listen more closely, the Performa3 BE-series models are in fact substantially different from their standard Performa3 counterparts and in ways that dramatically enhance sound quality. Specifically, the BE models feature Beryllium tweeters loading into revised die-cast waveguides and also use DCC (Deep Ceramic Composite) midrange and woofer drivers. As I listened to the F208E, it occurred to me that the speaker seemed able to channel an awful lot of the sonic goodness and nuance of the firm’s flagship Ultima2 Salon2 floorstanders, but for less than half the price. Who wouldn’t appreciate that price/performance equation? A high point of the show for me was getting the chance to talk with the famed Spiral Groove analogue designer Allen Perkins about his new Revolution turntable ($18,000, which was fitted with Spiral Groove’s previously released Centroid tonearm ($6,000). In fact, in an in-depth conversation Perkins even sketched for me an explanatory diagram of the Revolution’s remarkably effective main bearing in my reporter’s notebook. The Revolution/Centroid combination was on demonstration in the Mobile Fidelity (MoFi) room, where it was being used as the analogue playback vehicle of choice for use in auditioning the latest in MoFi’s series of UD1S (Ultra Disc 1-Step) reissues of classic vinyl recordings (in this instance a Bill Evans recording from the Live at the Village Vanguard series). The UD1S discs are limited by the nature of their distinctive production process to just 2500 copies per release so they are collectible rarities from the word go, and judging by the sound of the test pressings being played on the Perkin’s newest and least costly turntable to date, they are capable of breath-taking inner detail, subtlety, and nuance. Totem’s demo rooms at shows are typically joyous places to visit and this would certainly have been the case at CES 2017 but for one profoundly sad development that has resonated throughout the audio industry. Specifically, Totem has of late preferred to demonstrate its speakers using Bully Sound Company electronics, which are the brainchild of the Bret D’Agostino (son of the famous Dan D’Agostino). In fact, Totem had planned what was meant to be a co-exhibit with BSC/Bret D’Agostino and so was stunned (as were most of us in the industry) when Bret D’Agostino suddenly passed away without warning on January 3, 2017, just before the opening of the show. In light of this tragic development, the Totem team dedicated its CES demonstration systems to the memory of Bret D’Agostino and to the many gifts and talents he brought to the audio world. Perhaps as a fitting tribute to Mr D’Agostino, both of Totem’s BSC-powered systems were sounding flat-out incredible, showcasing two new speakers (plus a very promising loudspeaker prototype) that rivalled ELAC’s impressive Adante monitors for ‘best sound at a sensible price’ honours. The two models in question are the new Sky monitors (priced at $1,850/pair) and the somewhat larger and more expensive Signature One monitors (priced at $2,599/pair), while replaces the original (and pretty much legendary) Totem Model One—the speaker that first put Totem on the high-end audio map. The little Sky features a custom-made-for-Totem Morel mid-woofer that is, says Totem, very special in its performance capabilities and quite difficult to build (meaning demand for the Sky might, at times, exceed supply). The simplest way to describe the Sky would be to say that it is a revealing, evocative, and intensely musical loudspeaker that is just forgiving enough to be driven by normal-mortal-grade high-performance audio electronics (this as opposed to the too often seen phenomenon of the $2k/pair loudspeaker that needs $10k+ of audio electronics in order to work properly). A strong point is that the Sky sounds amazingly full-bodied and offers greater bass punch and depth than its comparatively small cabinet would lead you to expect. Stepping the game up further still is the Signature One monitor, which is somewhat like the Sky in its appeal, but offers notably greater resolution and definition across the entire audio spectrum and especially at both frequency extremes. As did the original Totem Model Ones, the new Signature Ones feature terrific imaging and soundstaging, plus what seems to be a near full-range sound that offers all the frequency response extension many listeners might ever want. The cost of this heightened performance (apart from the roughly $750/pair price differential between the Sky and the Signature One) is that the Signature One’s do like somewhat higher grade-electronics—though they sang quite beautifully when driven by BSC’s separates. Finally, we should mention a preview listen we had with Totems upcoming Element-series mini-tower speakers, which are so new that they don’t even have a name just yet. The mini-towers feature a very high performance tweeter supplemented by a pair of roughly 4-inch Torrent-technology mid/bass drivers. The slender mini-towers are barely more that six inches wide and only a bit more than three feet tall, so that visually speaking one’s first impression is that the little towers might image well but could not possibly produce deep bass or even much in the way of mid-bass. However, the visuals are highly misleading in this instance as Totem’s very long-excursion Torrent-technology drivers offered up powerful low-end performance that belied the speakers’ diminutive size. It’s way too soon to say what the finished model’s sound will be like, but based on what we heard these mini-towers may, among other things, turn out to be the world’s smallest full-range speakers. Loosely projected pricing for Element mini towers is about $6,000/pair. …and now for two special mentions. One of the most expensive but also most musically evocative systems at CES consisted of Kharma’s Enigma Veyron EV2 loudspeakers ($437,500/pair), Lamm’s new L2.1 Reference line-stage preamplifier ($22,790), two pairs of Lamm M1.2 Reference monoblock amplifiers ($55,180 in total), a deluxe Lamm LP2.1 phono preamplifier ($9,190), a vintage Garrard Model 401 turntable in a custom base ($7,500), a discontinued SME Model 2012-R tonearm ($3,500), an Ortofon Cadenza Black phono cartridge ($2,729), and—for digital playback—an EMMLabs XDS1 V2 integrated CD player and DAC ($25,000). Tying all these elements were some $54,490-worth of Tchernov Cables, plus $6,520-worth of Sanus and BDR racks. Add all these prices together and you get a total system price of $601,899, which is sobering to say the least. Yet for Bill Gates types among us, such a system could make sense. The beauty of the thing, really, is that it sidesteps assessment of layer upon layer of traditional audio performance parameters to simply convey the feel real music as played on real instruments by real musicians. And isn’t that really what’s at the heart of this hi-fi business in the first place? 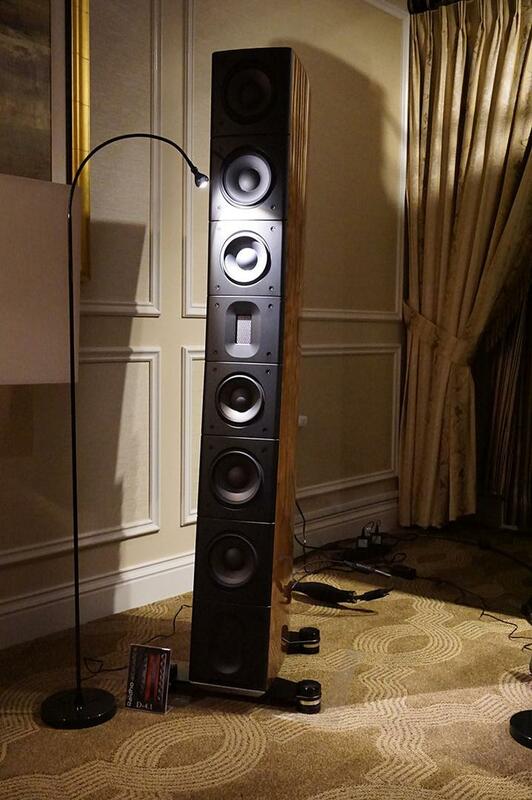 To my ears, the YG Acoustics/Audionet/Kronos/Kubala-Sosna system delivered the best all-round sound I heard at CES. The system consisted of a pair of YG Acoustics Sonja XV loudspeakers; an Audionet preamplifier, phonostage, DAC, and appropriate sets of Audionet monoblock amplifiers; a Kronos turntable and tonearm fitted with an Airtight phono cartridge, and cabling in the form of Kubala-Sosna’s new flagship Realization-series cables. Frankly, I had heard nearly this same system upon the occasion of the Sonja XV roll-out even a few months ago, but that was before Kubala-Sosna launched its new Realization cables, which have managed to unlock a whole new level of performance from the system. What is difficult to describe is the way the YG/Audionet/Kronos/Kubala-Sosna combination manages, on the one hand, to extract even the most minute textural and dynamic details and subtleties from recordings, complete with the requisite Tachyon-quick transients speeds, yet does so with effortless grace and an uncanny quality of unforced smoothness. Honestly, I think most hi-fi aficionados have grown so accustomed to thinking of trace amounts of edginess as being the inevitable artifacts that accompany most high-resolution designs that they simply don’t know what to do when confronted with a system that can provide copious s quantities of valuable musical information sans the usual sharp edges. Yet that is precisely what this amazing system does so very well. Indeed, this system is so smooth, so gracious, and so effortless that it’s tempting to think, “Well, perhaps this mean it’s leaving a bit of desirable resolution on the table.” But, the longer you listen to the system, the more obvious it becomes that there really is nothing missing. Instead, this system is that rare sonic beast that—in sonic terms—gives you all gain and essentially no pain. Once you grasp that, the system begs for further listening, inviting you to exploring recordings as never before, but without having to ‘brace for impact’ with rough edges that, as if by magic, never seem to materialize.